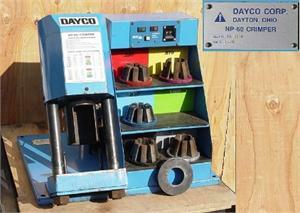 The Dayco NP60 hydraulic hose crimper is accurate, reliable and easy to operate. It delivers 60 tons of force through six standard die sets to let you crimp 1 and 2 wire hose through 1-1/2" I.D. and 4 spiral hose through 3/4" I.D. (or up to 1-1/4" 4-spiral hose with optional dies). It is an adjustable hose crimper, capable of crimping just about any hose and fitting combination. This equipment must ship via common carrier. Call us at 800.624.7660 with your Zip Code and we will gladly furnish you with a shipping quote.